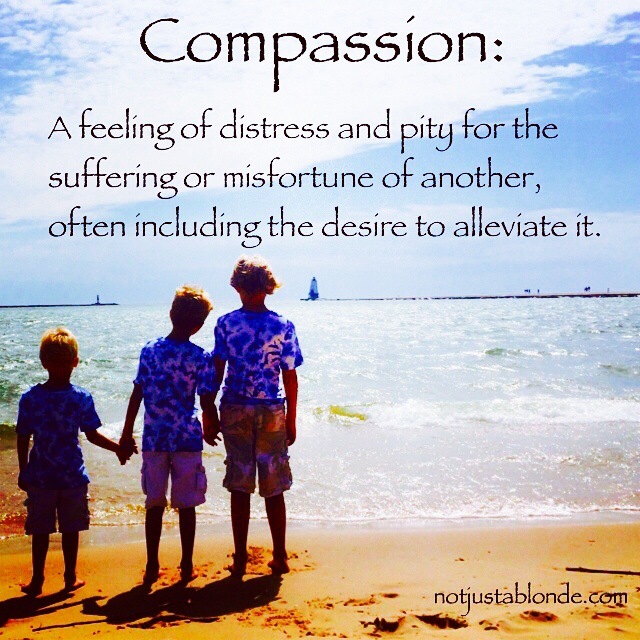 We need more compassion in our world and in our lives. When we hurt along with others who are hurting, we are connected to them through their suffering. This connection is a pathway for love. We are able to grow more compassionate by getting outside of ourselves and suffering alongside those who suffer. It’s this ability to imagine what could comfort another that allows us to love our neighbor as we love ourselves. Compassion is the catalyst for empathy. Empathy is the catalyst for knowing how to best love others as we ourselves would want to be loved. It is how we are able to imagine another’s needs and how to best give them love. Compassion converts empathy into acts of love and kindness. Love in action heals broken hearts and broken people… and in time a broken World. To bring more love into our world and into our lives we need to cultivate more compassion. Compassion is one of love’s most important ingredients! Ann, this time it is you who has given me food for thought and it comes from the sentence ‘love your neighbor as you love yourself.’ Firstly, this is the way that God has always had me read that phrase from the Bible, because it emphasizes that to love other people as we need to, we first have to love ourselves. However, God has told me several times that I do not love myself enough, so I have had to ask Her to help me to love myself enough, but it hasn’t happened yet. Coming from this start point, I have been required to go again over some old ground, because it has become fairly clear to me that, despite having a good imagination in many aspects, I find it difficult to imagine certain situations, because I have not experienced such situations, or anything remotely like them. One example would be the love that a mother experiences for her baby and therefore also the feeling of loss that would result if that baby died. In the same way, I cannot imagine what it must feel like for a woman who is raped, although I realize that it must be a physical and emotional experience of violation, degradation and oppression. This brings us round to something that has been touched on in your recent posts, which is that God allows certain people to suffer in certain ways, so that they can empathize with the suffering of other people who have suffered in similar ways, and thereby to help them to suffer less. That requires the one who wishes to empathize having to be willing to undergo suffering, through a triggering of their own recollections. Again God has brought me back to this subject, because it raises the question: how do we know the right thing to do to to help someone who is suffering? The examples that have come to my attention concern people who had been found to have cancer. Several years ago, my wife was diagnosed as having endometrial cancer. Fortunately, it was at an early stage, so that it was operable through her having a hysterectomy. You might think that she would have liked friends to have visited, to take her mind off the cancer, but she really did not want to see anyone other than our daughter and me. This means that the response we would normally associate with empathy, to visit, would have caused her to suffer more than to have merely been sent cards of sympathy. Presumably it was easier for her to keep her mind off worrying about the cancer if she focused on a book, or watching TV. At present, a friend whom I have known for 40 years is convalescing at home after the removal of a bowel cancer. Even my wife says: ‘you ought to go and see him’ and I would like to do so, but I have to rely on God to guide me in the right thing to do, which is not to go and see him. If we rely on our own wisdom, we do not know what is the right thing to do, but God is willing to guide us, if we submit to Her guidance. There is another relevant example of this, which again relates to my wife’s endometrial cancer: after she had been operated on, the surgeon, who was one of the foremost specialists in his field, wanted her to have radiation treatment ‘just to make absolutely certain.’ However, my wife and I were aware of how much my mother had suffered side effects later in her life through having radiation treatment for cervical cancer. Without her knowledge (because she does not believe in God) I asked for God’s guidance and She told me to recommend my wife not to have the radiation treatment, and she didn’t have it. It is now more than 7 years since the operation and the cancer has not returned.